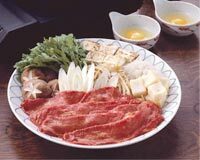 Sukiyaki is an ideal recipe for winters. Learn how to make/prepare Sukiyaki by following this easy recipe. Cut vegetables and place on large platter. Combine all the sauces in a separate bowl, mix well. Heat electric fry pan, cook the thinly sliced meat till brown, sprinkling with 1/4 cup sugar, move it over to one side. Place this cooked meat in a skillet, pour sauce over it and add other ingredients. Cover and bring it to a boil and cook for about 2 minutes. Always cook Sukiyaki in an electric fry pan instead of wok, so ingredients stay separated.